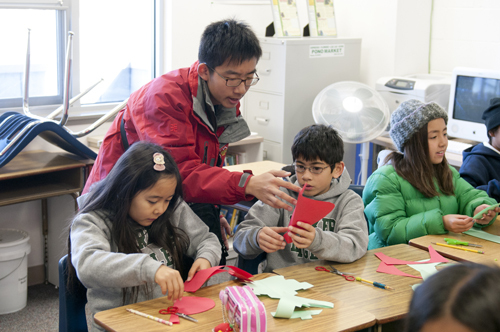 Nineteen students from the World Foreign Language Middle School (WFLMS) in Shanghai, China, visited Harker in mid-January for this year’s exchange between the two schools. The visitors stayed with grade 8 families who kept them busy with activities, including visits to the many beautiful and historic sites in the area. While at Harker, the students spent their days observing and participating in classes, such as Monica Colletti’s drama class and Elizabeth Saltos’ art class. They also made Native American dream catchers with middle school history teacher Keith Hirota and embarked on a scavenger hunt on the middle school campus. Another highlight of their visit was a trip to Stanford University, where they toured the large campus and got to peruse its bookstore. Later that day, back at Harker, they enjoyed a dance class taught by Gail Palmer. On the final day of their visit, the students were treated to a farewell breakfast, where students from both Harker and WFLMS gave special performances. The Harker students will visit their WFLMS friends in China in late March.